The final version of this article with its full bibliographical information is available. To access the article, click here (Vol. 79 (2015), No. 3 pp. 668-669). Congenital left ventricular (LV) aneurysms are rare cardiac malformations.1 They appear to be developmental anomalies that arise during the fourth embryonic week.2 Clinically, most congenital LV aneurysms are asymptomatic, but some may cause systemic embolization, heart failure, valvular regurgitation, ventricular wall rupture, ventricular tachycardia, or sudden cardiac death.3–5 Here we describe a congenital LV aneurysm that caused ventricular tachycardia, and was diagnosed using cardiac magnetic resonance imaging (CMR). A 17-year-old man, without any relatives and who lived in welfare facilities, presented with palpitations. His vital signs were normal and his heart sounds were normal, with an irregular rhythm, but no murmur. 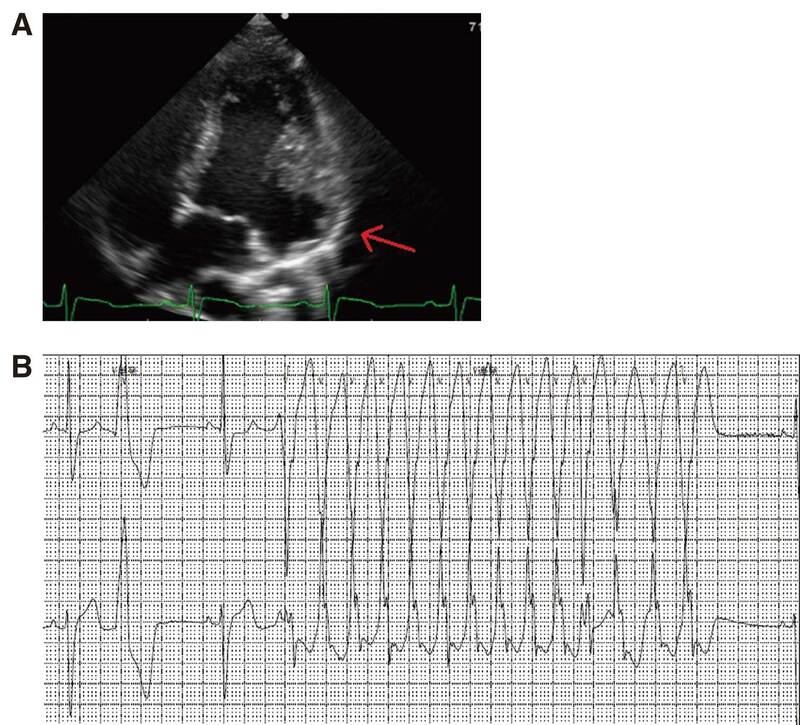 Electrocardiography (ECG) showed multifocal premature ventricular contractions (PVC), and transthoracic echocardiography indicated diffuse LV systolic dysfunction (estimated ejection fraction, 37%) and an anterolateral aneurysm (Figure 1A). On Holter ECG monitoring frequent PVC (26,333 beats/day; 24.7% of the total heart rate) and non-sustained ventricular tachycardia (NSVT) were noted (Figure 1B). 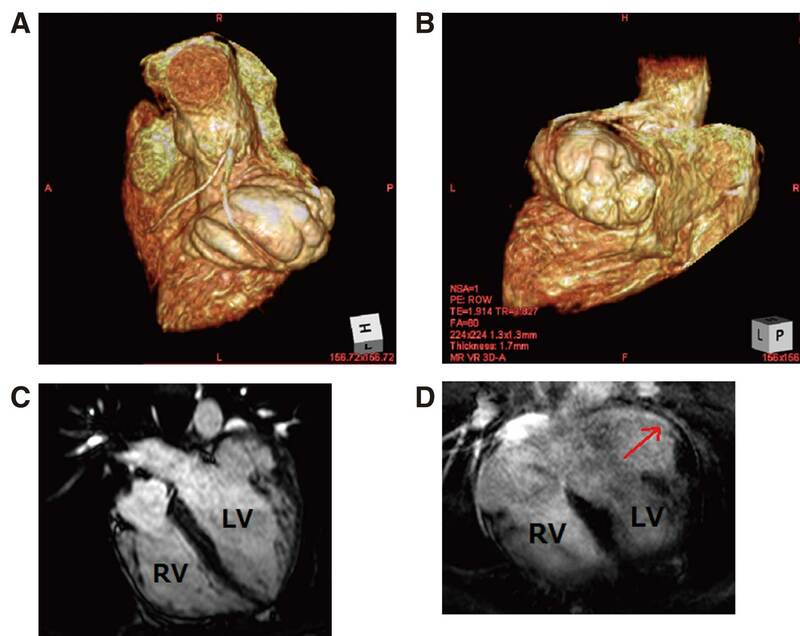 CMR showed a LV anterolateral multilocular aneurysm (6.7 cm×3.9 cm; 3D-CMR, Figures 2A,B; cine magnetic resonance imaging [MRI], Figure 2C) with late gadolinium enhancement (LGE) on the endocardial side (Figure 2D). He did not report any traumatic causes. Coronary angiography excluded coronary artery disease, and local or systemic inflammation was excluded based on laboratory data and MRI. MRI also excluded other cardiomyopathies. (A) Aneurysm in the anterolateral left ventricular wall (arrow). (B) Holter electrocardiography showing non-sustained ventricular tachycardia (14 couplets; 219 beats/min). (A,B) Three-dimensional cardiac magnetic resonance imaging showing left ventricular (LV) aneurysm (6.7 cm×3.9 cm) in the anterolateral wall. (C) Cine magnetic resonance imaging showing hypokinetic apical LV wall motion and mild thinning of the aneurysm wall. These findings suggested congenital LV aneurysm. (D) Late gadolinium enhancement is apparent on the endocardial side of the aneurysm. RV, right ventricle. LGE during CMR is very useful for evaluating LV function and for discriminating cardiomyopathies.6–8 In the present case, CMR clearly showed a large, multilocular aneurysm with LGE in the LV. CMR helped diagnose a congenital LV aneurysm, and LGE suggested poor prognosis. After oral amiodarone therapy and implantation of a cardioverter defibrillator, NSVT disappeared. This is the first report of 3D-CMR of a congenital LV aneurysm with documented ventricular tachycardia. We have no relationships to disclose. 1. Teske DW, McGovern JJ, Allen HD. Congenital fibrous left ventricular diverticulum. Am Heart J 1993; 126: 1233–1235. 2. Papagiannis J, Van Praagh R, Schwint O, D’Orsogna L, Qureshi F, Reynolds J, et al. Congenital left ventricular aneurysm: Clinical, imaging, pathologic, and surgical findings in seven new cases. Am Heart J 2001; 141: 491–499. 3. Vazquez-Jimenez JF, Muehler EG, Daebritz S, Keutel J, Nishigaki K, Huegel W, et al. Cantrell’s syndrome: A challenge to the surgeon. Ann Thorac Surg 1998; 65: 1178–1185. 4. Parthenakis FI, Kochiadakis GE, Patrianakos AP, Hamilos MI, Mitrouska I, Katsamouris AN, et al. Peripheral arterial embolism due to a left ventricular diverticulum in a young adult. Chest 2005; 127: 1452–1454. 5. Pektok E, Cikirikcioglu M, Didier D, Kalangos A. Submitral left ventricular aneurysm: A rare but challenging pathology to treat. J Card Surg 2008; 23: 533–535. 6. Moon J, Hong YJ, Kim YJ, Shim CY, Jang Y, Chung N, et al. Extent of late gadolinium enhancement on cardiovascular magnetic resonance imaging and its relation to left ventricular longitudinal functional reserve during exercise in patients with hypertrophic cardiomyopathy. Circ J 2013; 77: 1742–1749. 7. Kido T, Nagao M, Kido T, Kurata A, Miyagawa M, Ogimoto A, et al. Stress/rest circumferential strain in non-ischemia, ischemia, and infarction: Quantification by 3 Tesla tagged magnetic resonance imaging. Circ J 2013; 77: 1235–1241. 8. Nakamori S, Matsuoka K, Onishi K, Kurita T, Ichikawa Y, Nakajima H, et al. Prevalence and signal characteristics of late gadolinium enhancement on contrast-enhanced magnetic resonance imaging in patients with takotsubo cardiomyopathy. Circ J 2012; 76: 914–921.